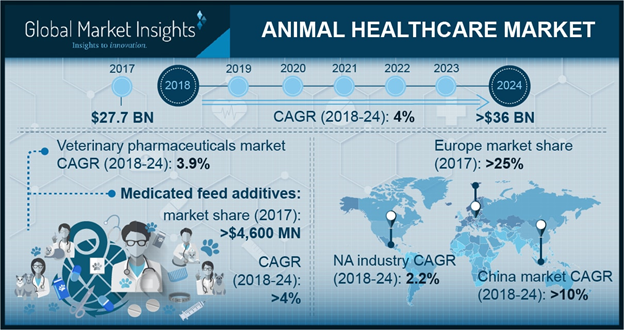 Animal Healthcare Market size is poised to cross USD 36 billion by 2024, as per a new research report by Global Market Insights, Inc. Burgeoning adoption of pet animals across the world, especially in developing countries is one of the major factors driving the global animal healthcare market growth. With increasing disposable incomes, pet owners afford to spend more on pet healthcare, resulting in expanding animal healthcare industry size.